Attaining her master’s in business administration was going to be a daunting task, but Ericka Gutierrez was up for it. Most days began around 5 a.m. for her. She finished up tasks and assignments she hadn’t the night before at the library, prepared for another day and saw her 5-year-old daughter, Aryana, off to school. She was at her desk by 8 a.m., working as outreach coordinator for the UCA Office of Diversity & Community. From there, she either worked several hours at her part-time job or attended night class. That was followed by a few hours in the library each night to work on assignments. Then, she tried to get a few hours of sleep before the next day began. Gutierrez first came to UCA in 2012 as a transfer student from the University of Arkansas Community College at Morrilton. After she settled on a management degree with an emphasis in logistics and supply chain management, Gutierrez said Scott Nadler, Ph.D., associate professor of management, walked her through her first career fair, introducing her to his contacts in the industry. That type of support and encouragement continued throughout her undergraduate with other professors including Doug Voss, Ph.D., associate professor of logistics and supply chain management, and Michael B. Hargis, Ph.D., dean of the UCA College of Business and then-associate professor of marketing and management. When she graduated in 2014, Gutierrez had various opportunities in logistics and supply chain, but the pull to work at UCA was too strong to ignore. She accepted a position as an admissions counselor and began recruiting throughout central and northwest Arkansas. 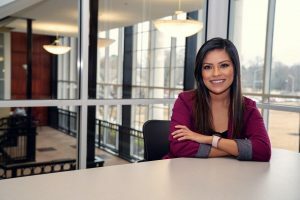 Her previous experiences in the college, along with an opportunity she saw to grow personally and in her career, Gutierrez returned to the College of Business in 2016 to pursue an MBA. Gutierrez immediately saw the benefits of the program. Concepts in Organizational Behavior helped Gutierrez better address and counsel students in her new position as coordinator for Hispanic and Latino outreach initiatives in the Office of Diversity & Community. Her Innovation Leadership course with Jeff Standridge, Ph.D., adjunct instructor of finance and member of the College of Business Advisory Board, “changed my perspective in my personal life, motherhood and in my career,” said Gutierrez. While many of the days were long, Gutierrez said smaller class sizes, paired with helpful professors and hybrid courses helped her tremendously. Ultimately, her time in the MBA program was transformational for Gutierrez.